Suitable for events indoors, outdoors, or mixed. Best for groups of 16-300. Teams of 4-10 players. Duration 1.5 hours. Our most flexible challenge course: it can be played indoors or outdoors, and it’s easy to fit into any timeline, though 2 hours is most traditional. Players are split up into teams and test their wits, might, and mettle in a variety of challenges. Teams can go at their own pace, choosing their own adventure, devising strategies, tackling the tasks, and making memories. On-site game masters draw out everyone’s hidden skills and talents: this game is a great way to spotlight your team’s diversity. Everyone gets the chance to be the hero! In a conference room or out en plein air, this event delivers gobs of participation and enjoyment by all. Are you ready to get in the game? 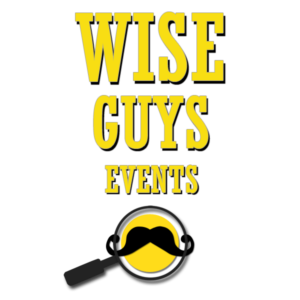 Think the Wise Guys team can bring some fun to your next team building event? Contact us today for a free quote!